Attorney General Jeff Sessions exercised his authority Monday as the ultimate reviewer of the immigration court system to overrule a series of Obama-era decisions that were allowing the radical expansion of the American asylum system. Traditionally, the “social group” category was seen as akin to the others, a defined group with identifiable characteristics whose members faced danger and persecution. Asylum was for anti-Communist Afghans who for refused to be drafted into the Soviet occupation’s army, Jehovah’s Witnesses who faced arrest for holding meetings, and so on. Coverage of Sessions’s action has focused largely on the specifics of domestic violence victims and women with children, but the ruling has much further reaching implications. In its own terms, it seeks to halt the rapid expansion of the asylum concept to cover victims or even potential victims of regular private criminal activity. Open borders groups and the immigration bar have for years sought to turn the exception of asylum for persecuted groups into a rule that people more likely to be victims of ordinary crime in their home countries have a right to move to the United States. In 2005, for example, an immigration lawyer unsuccessfully asked a federal appeals court to expand asylum to cover “young, attractive Albanian women,” because they were more likely to be forced into prostitution. In 2011, a lawsuit asked a different court to do the same for people who were “resistant” to gangs. 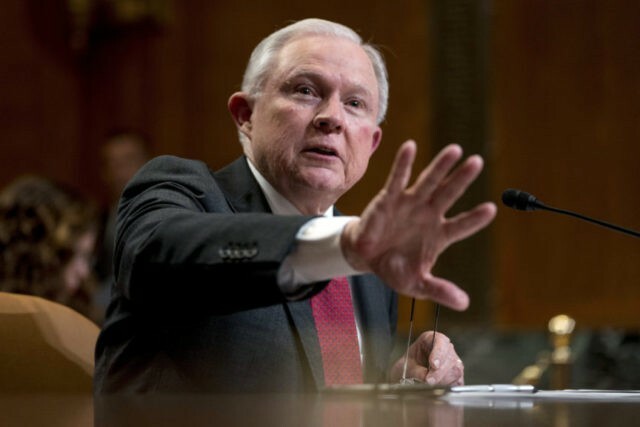 Sessions’s opinion Monday, Matter of A-B, likely forecloses, for now, this effort to use existing immigration law to force the United States to admit more and more people who enter the country without authorization and claim asylum based on dangers inherent in the less developed countries from which they come. Monday morning, Sessions announced the decision would be coming at the Executive Office for Immigration Review’s (EOIR) Annual Training Conference for Immigration Judges in Tysons Corner, Virginia. “Beginning in 2009, more and more aliens who passed an initial USCIS credible fear review were released from custody into the United States pending a full hearing,” Sessions said of the system that led to this year’s “caravan” debacle. Powerful incentives were created for aliens to come here illegally and claim a fear of return. In effect, word spread that by asserting this fear, they could remain in the United States one way or the other. Far too often, that rumor proved to be true. The results are just what one would expect. The number of illegal entrants has surged. Credible fear claims have skyrocketed, and the percentage of asylum claims found meritorious by our judges declined. This backdrop set the stage for the so-called “caravan” of Central American migrants who reached Southern California this April. Making credible fear claims to USCIS officials at the San Ysidro, many of these otherwise illegal migrants were able to join Americas 700,000-strong line of pending immigration cases, and stuff in the U.S. while they await a ruling. Long before the caravan, Sessions was trying to draw attention to the issue of asylum abuse, asking Congress to “close loopholes and clarify our asylum laws” in October. Monday’s action represents another example of Sessions using his own authority as attorney general to affect these same aims. Last month, he used the same authority to restrict the circumstances in which immigration judges can drop deportation cases. Sessions has also shifted prosecutors and immigration judges to the border to more quickly handle asylum claimants and sought, where possible, to prosecute immigration lawyers engaging in asylum fraud to keep their clients in the U.S.